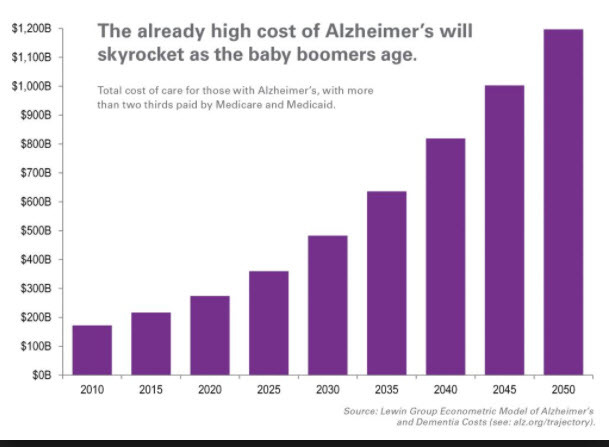 Alzheimer’s disease is costing the U.S. economy 277 billion dollars a year. Mind staggering numbers! About 6 million Americans currently suffer with Alzheimer’s, and 5.5 million of them are senior citizens, aged 65 and older. By 2025, the number of seniors with Alzheimer’s could reach 7.1 million, according to CBS News. And, if no new treatments are found, that number could hit 13.8 million by 2050, according to the Alzheimer’s Association. Every 65 seconds, someone in the United States develops Alzheimer’s disease. By 2050, that will occur every 33 seconds. While deaths from other major diseases keep declining, Alzheimer’s deaths have more than doubled, rising 123 percent between 2000 and 2015. By comparison, the number of deaths from heart disease, the leading cause of death in the United States fell 11 percent. This growing cost impacts the nation’s health care system, and also points to the growing financial, physical and emotional toll on families facing this disease.